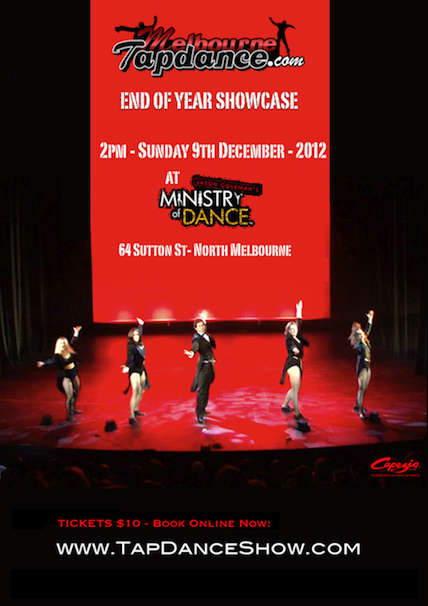 Students and troupe members of Melbourne Tap Dance present a 45 minute showcase in a close intimate environment. With a repertoire of famous and original routines, moods from peaceful to agressive and music ranging from jazz to hip hop this is a feel good show with soul that will inspire and leave you smiling! but BOOK ONLINE now for Adults $10 only! After booking online, your name will automatically be placed on a guest list (under the name of the person who booked) so you / your group can just show up on the day – no need to print tickets!